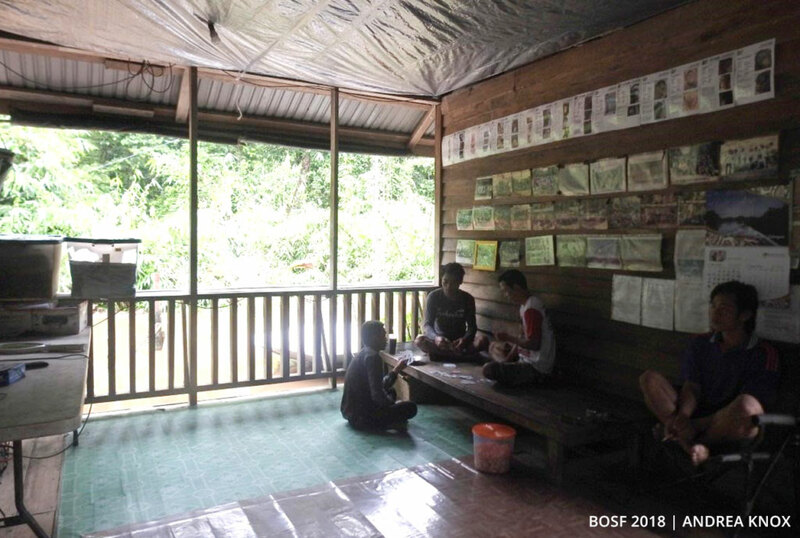 September 7, 2018 — Our Post-Release Monitoring team from Camp Totat Jalu in the Bukit Batikap Protection Forest, Central Kalimantan, undertakes many tasks in addition to collecting behavioural data on reintroduced orangutans. 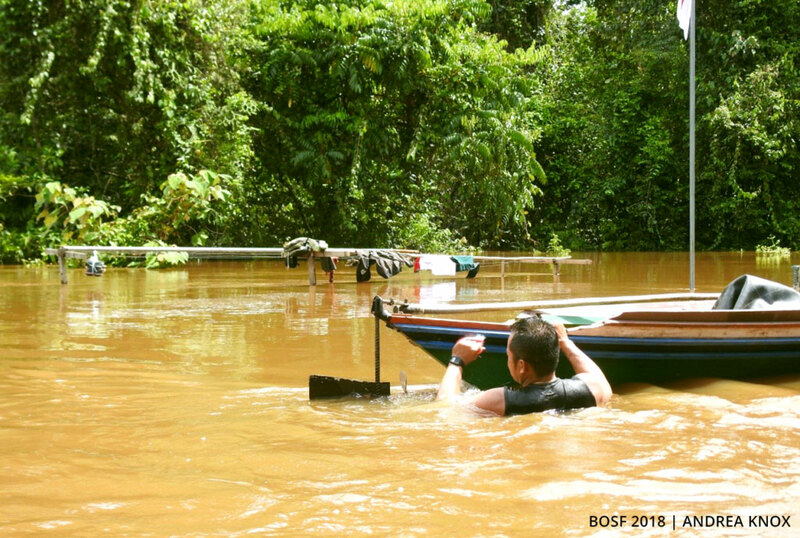 Team members help maintain and make repairs to equipment around the camp; conduct monthly phenology surveys to record the types of flora and fauna found in Batikap; and, as of May this year, quickly pack up camp in record time to escape floods. Our camp sits at the top of two banks, out of view of the Posu River. Every once in a while, a bout of heavy downpours causes the river to rise to the top of the first bank, making it visible from camp. 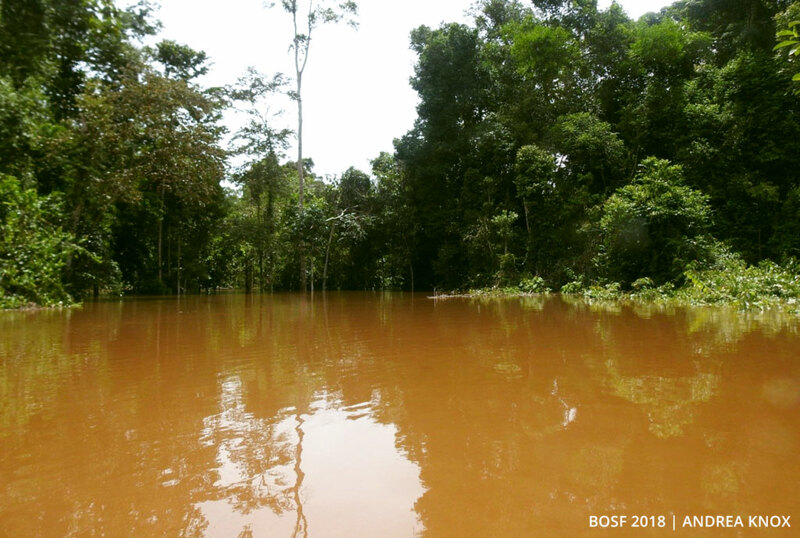 Our work is put on hold when this happens, as the transects we use also become flooded; nevertheless, life around camp continues as per usual. Nothing seemed to be out of the ordinary on the morning of May 28, 2018, until I stepped out of my room. It was 6 a.m. and I was surprised to see the Posu River spilling over the first bank and starting to fill the second. A boat had already been moved and tethered to camp. One of the technicians was moving containers of gasoline, and called out to me, “Air akan naik terus hari ini!”; “The water will continue to rise throughout the day!”. The water was still a distance away, and no one seemed to be too worried. However, we took precautions, by tying down or moving all loose wood and supplies that were usually stored on the ground under camp. Two hours later, water began to spill over the ground directly under camp, and showed no signs of stopping! Everyone started to pack up their loose belongings and move everything off the ground and on to beds, benches, and into the rafters. Still, everyone remained calm. I even joined in on a game of Gin Rummy with the technicians, as the water precariously snuck up to our left. When the water got to within a centimetre of flooding the floor, everyone shifted into full evacuation mode! 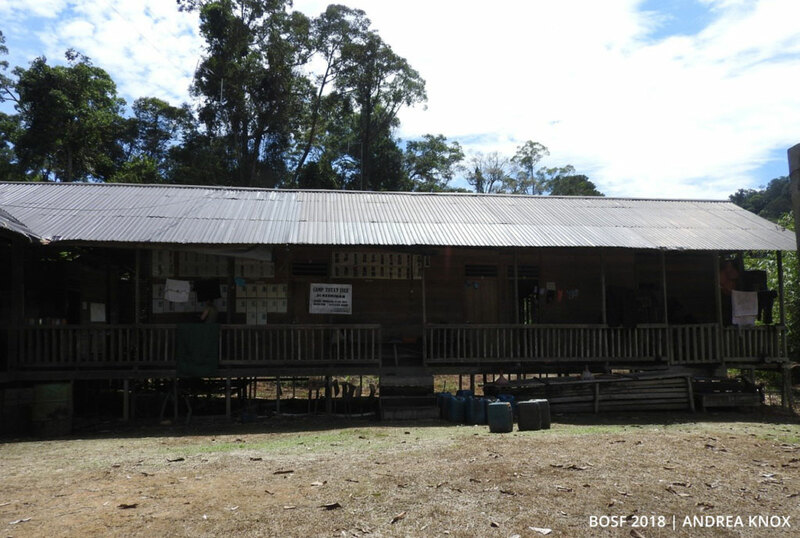 Solar batteries were moved from the floor, bags of important belongings were packed and stowed in the highest reaches of camp, and all three boats were moved to a position directly in front of camp. 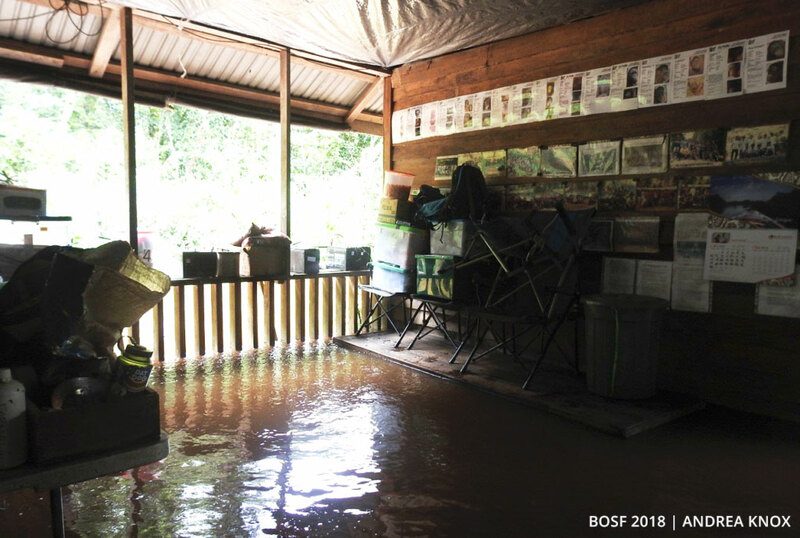 As we trudged through the ankle-deep, then calf-deep waters, we continued to move items from the lower benches and create large towers of boxes, bags, and equipment high above the floor. We had done all we could short of packing the boats and abandoning camp – all that was left for us to do was wait. And wait, we did. Both the water and internal panic continued to rise. First to my knees, and then my thighs, until eventually the water sat just beneath my hips. The rising waters soon slowed, and with that everyone could breathe again. A sense of relief washed over everybody – we had made it through the worst! It was now about 1 p.m., and there was nothing to do but wait patiently for the waters to recede. A panic-filled morning was followed by a laid-back afternoon, with some people opting to take a nap (only on the top bunks, of course!) and others taking a dip (in the area normally used to dry laundry). Music was played and the camp cooks, working in knee-deep water, even managed to put together dinner for everyone! By 7 p.m., the water had finally subsided to below the floor, and everyone took to cleaning debris left from the flood. 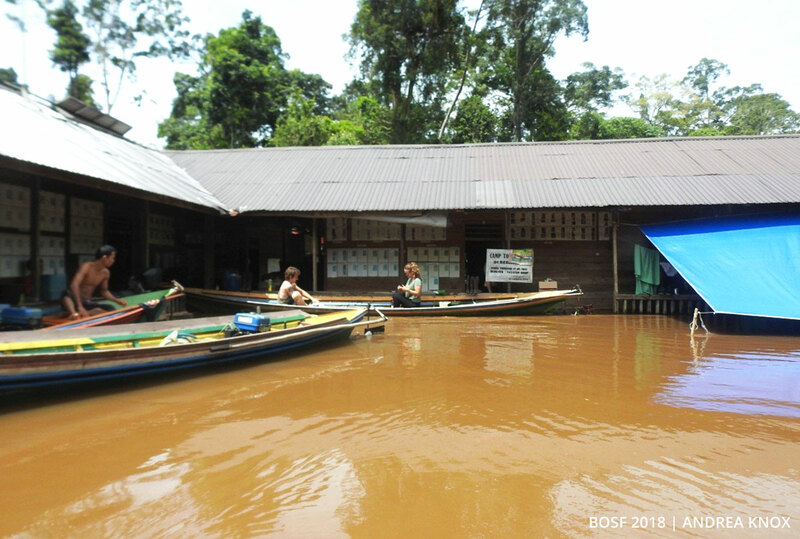 An hour later, everything was back to normal (with the exception of the water still beneath camp) and the boats had been returned to their usual spots on the river. 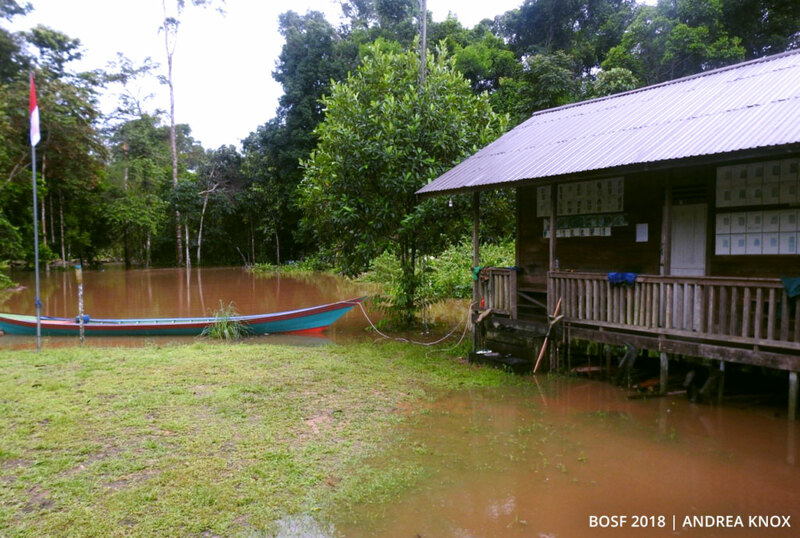 On this day, a new record was made for the highest flood waters to ever hit Camp Totat Jalu; a record that will hopefully never be broken!